Cha-cha-cha-CHIA! Yes, that is what we think of when we say chia. Those funny terra cotta heads sprouting green hair. Until now! Chia seeds are everywhere these days and have been sweeping the nation as an up-and-coming nutritional ingredient. Chock full of fiber and omega-3’s, these little seeds can be added to almost anything from juices, baked into muffins or even toasted and sprinkled on a salad! They digest quickly, hydrate your body better than sports drinks, and provide long-lasting energy. Athletes love them! When soaked in a liquid, they become gel-like and are virtually tasteless. In Mexico, they are added in a drink called Chia Fresca made with fruit juice and chia seeds which have been plumped in water – sounds so refreshing! I love a plumped spoonful spooned over a margarita for fun texture! I have also used them plumped then blended in a low-fat salad dressing – they work as a natural thickener so you can use less oil, and who doesn’t love that!? If you’re looking to add chia seeds to your diet, check out stores like Whole Foods, PCC, and in the “Natural Foods section” of most grocers to buy them or try them in a fun chia beverage. And check out this chia seed post from Wellness Mama for more tricks and tips on what to do with them, including her recipe for healthy homemade pudding. To plump chia seeds: Soak 2 Tbsp Chia Seeds with 1 1/2 cups HOT water. Let sit for 1 hour then store refrigerated for up to 2-3 days. Pickled or roasted, steamed or boiled. I adore beets whatever way they’re prepared! I even grate them raw into salads for some fantastic color, roughage, and flavor. In addition to being delicious, beets are REALLY nutritious. Betalains are the nutrient-rich pigments found in beets which also act as antioxidants – they can have anti-inflammatory benefits as well, and can even reduce your risk of heart disease. Beets are a great source of fiber and vitamin C! If you boil or roast your beets, don’t bother peeling them before-hand. Once they’re cooked, the skins will rub and peel right off! 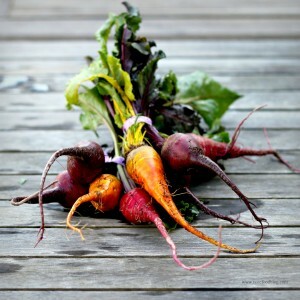 Just don’t forget to wear gloves… those pigments will dye your hands the same color as the beets! Looking for a mashed potato alternative? How about trying my Mashed Roasted Beets with Lime, Sour Cream and Cilantro. This will turn the most resistant beet eater into a beet enthusiast in no time! The sweet flavors of the beets with the zing of the lime and a dollop of low-fat sour cream will make this a family favorite. Oh, and if you are buying beets with the tops on don’t forget you can eat the greens too – just saute with some olive oil, garlic and a little onion and serve with a squeeze a lemon. As soon as beets are cool enough to handle, slip the skins off and cut into large chunks. Place in food processor with butter and 3 tablespoons of the sour cream; process until smooth-like in texture but not a total puree. Mix in lime juice, coriander, pepper flakes and chopped cilantro. Season to taste with salt. Serve hot, dolloped with remaining sour cream if desired. Restaurant Hospitality Magazine posted an article on syrups used in savory dishes, including my easy tips for making flavored butters. Check out the article here. A true sign of fall: apples appear everywhere. From thick caramel-coated and dipped in nuts to sweet and tangy cups of fresh-pressed cider at the local market to grand glass bowls filled with elegant red apples simply used as a table centerpiece. The Northwest has always been the hub for amazing apples. Glorious Galas with their perfume-y sweet flavor, firm Fujis that hold their texture amazingly well when cooked, deep-blushed Braeburns, and the list goes on. What most of us (at least us pie-lovers) think about when thinking of apples is pie, I love to make my apple pie with a little cheddar in the crust – yum! But in addition to desserts there are bushels of other great ways to cook with apples. 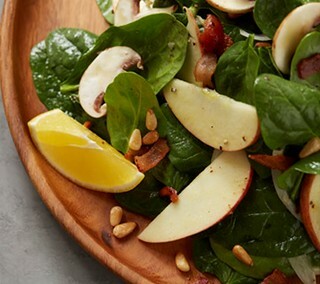 Try whipping up a Spinach & Apple Salad with Warm Meyer Lemon-Bacon Vinaigrette. It’s really quick and delicious. Looking for a new side dish? How about a toothsome Apple Barley Risotto – a twist on the classic using pearl barley instead of Arborio rice? Just remember, one of the best apple tips to observe is to always keep your apples refrigerated. At 70 degrees, apples break down and become soft 10 times faster than if refrigerated. Many a Northwesterner accomplished this in the olden days by stashing the winter’s apples under the bed, back when winter bedrooms were quite chilly. I bet those rooms smelled appley great! Place spinach, apple and onion in a large, heat-proof bowl and refrigerate until ready to dress salad. In a small nonstick pan, cook the bacon over medium-high heat until three-quarters done, about 2 to 3 minutes. Add garlic and stir for about 30 seconds, but do not brown garlic. Add the reserved vinaigrette to the hot pan. Immediately remove from heat and pour over reserved spinach mixture. Allow about 50 – 60 minutes total cooking time for this recipe. In a large heavy-bottom saucepan melt the butter over medium-high heat. Add the mushrooms and red onions. Sauté till mushrooms are limp. Add the garlic and stir around for about half a minute. Then immediately add the wine, increase heat to high and reduce wine till syrupy, about 3 minutes. Reduce heat to medium and stir in the diced apple and barley. In a bowl or large measuring cup mix together the broth and water. Add 1 cup to the barley and simmer till almost all the liquid is absorbed about 6 – 8 minutes. Stir in another cup of the broth-water mixture and continue cooking, stirring often, until all the liquid is absorbed. Repeat this process again until all the liquid has been used and the barley is tender. Remove from heat and fold in cheese, nuts and pepper. Taste and season with additional salt if needed.